Oh Yes, the only thing you want for Christmas has been delivered and is ready for you to collect from your next walk, the Greyhound Walks Information and Walk Dates Calendar for January to June 2018. Handy folding A5 just right for slipping in your pocket or behind you sun shield in the car. 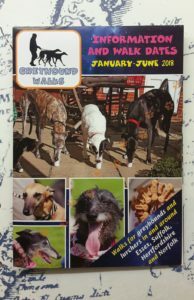 If you can’t get to a walk for a while but would like a copy of the calendar send a SAE to Greyhound Walks, 5 Washall Drive, Braintree, CM77 7GF, we’ll happily pop one in the post for you. Hope to see you at one of the walks.